Shenandoah National Park Day Trip Ideas — . Welcome to my blog. I document my adventures in family travel. Hope you have a nice stay! The White Oak Canyon / Cedar Run hiking trails are summer staples for us. Both trails will take you to some spectacular waterfalls and swimming holes - making this an excellent hike with kids. There are several hiking options depending on your interests and abilities. Whatever you choose to do, I recommend starting at the White Oak Canyon Lower Parking lot as it's closer to all the waterfalls in this area. If you want to see all the falls and are up for a strenuous hike, you can do the 8 mile Cedar Run - Whiteoak Circuit hike. This hike will take you past 6 waterfalls on the Whiteoak side - many of which include swimming holes. Then it's a steep climb up a fire road before heading down the Cedar Run side with two more waterfalls. The payoff on the Cedar Run side is the natural water slide and jumping rock at the last two waterfall swimming holes. With the considerable elevation change (2794 ft.) and factoring in swimming time, this can easily take five hours or more. You will sweat a lot on the fire road portion of this hike. Butterflies will take advantage of the salt in your armpits. If you aren't up for all of that, you can still manage to see all six White Oak Canyon Waterfalls in a 4.5 mile out and back round trip hike from the Lower Parking on the White Oak Canyon Trail. The Upper Falls is 86 ft. tall so a lot larger than it appears in this photo. This is the last of the six White Oak waterfalls and can be a great place to take a dip. If you would like more water play and less hiking, you can do an out and back 3 mile trip from the Lower Parking on the Cedar Run Trail. This will take you to the above-mentioned water slide and jumping rock. I would be nervous to let kids under 9 go down the slide or jump off the rocks, so just keep that in mind if you are planning a hike with kids. That being said, Jimmy and I have taken our 8 month old son up this way and we just took turns going down the water slide while the other parent watched the baby. There are still spots for younger kids to play in the water on the Cedar Run side - even kids that can't yet walk. 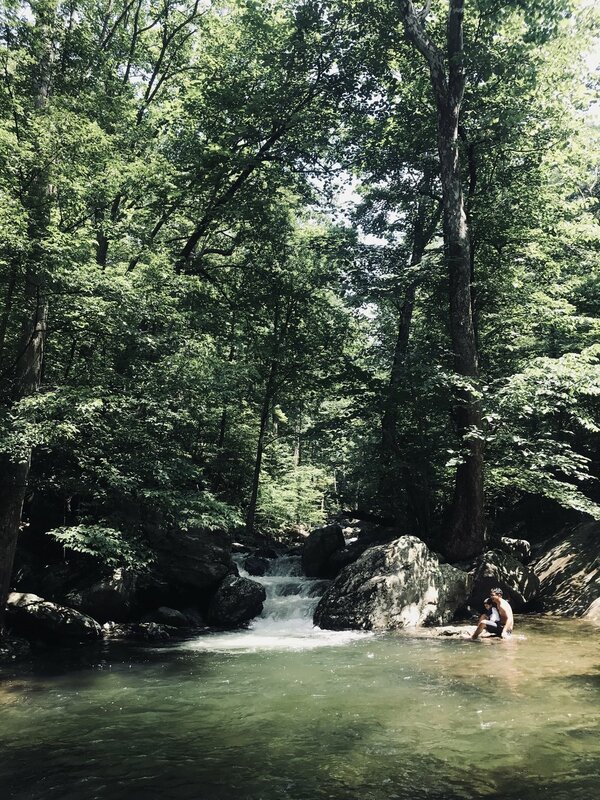 If you want a really short hike that still offers a decent swimming hole, you can do a 2 mile out and back hike from the Lower Parking on the White Oak Canyon Trail. 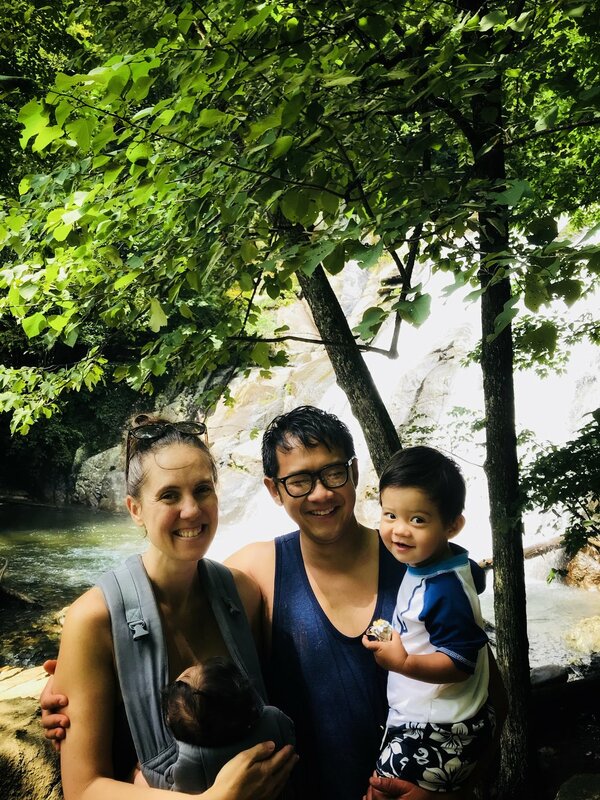 This is my favorite option for families with little kids as the swimming hole is really accessible to little people, and it's also a great training hike for little legs. We saw a two-year old do this hike the last time we visited. Just make sure your kids stay on the trail - rattlesnake and copperhead sightings are common off the trail. This swimming hole has a shallow end great for toddlers and a deep end great for true swimming hole swimmers. Warning - your toddler will want to stay at this swimming hole all day. While this area is a summer favorite, it can also be incredibly beautiful in the winter. The frozen falls are especially magical when it is snowing. Note - the views are better when the deciduous trees lose their leaves. My post hike nosh recommendation is Graves Mountain Lodge which is only a 5 mile drive from the White Oak Canyon Lower Parking. Graves Mountain Lodge has several festivals throughout the year including a Peach Day in the summer. If you plan a hike for a festival day, you can treat yourself to barbecue, ice cream, music, and a hayride. During non-festival times, you can eat in their restaurant but make sure you bring a serious appetite. All of their meals are all-you-can eat and are often served family-style. The southern dishes keep coming to the point that it is challenging to find more room on the table. Even if you just eat a small spoonful of everything they bring out, you will leave stuffed to the gills. Mary's Rock offers a beautiful summit view on the famous Appalachian Trail (AT). My favorite time to hike this trail is early summer. During this time, you are likely to see lots of rhododendrons and mountain laurel in bloom. You are also likely to see several thru-hikers on their way from Georgia to Maine. I think it’s fascinating to talk to thru-hikers and learn about their experiences. I like to bring them chocolates as a little boost of encouragement. There are several options to get to the view at Mary’s Rock. The two easiest options involve parking off the skyline drive. From the Meadow Spring parking area, it’s a 2.9 mile round trip hike. If you park at the Panorama parking area, it’s a 3.7 mile round trip hike. Both of these options are out and back hikes with about 1000 ft elevation change. A Maine - Georgia thru-hiker took this picture of me and my bestie at the summit in the fall. If you want more of a workout, you can make a 9 mile circuit hike by adding the Buck Hollow and Buck Ridge trails to the Meadow Spring Hike. Park at the Buck Ridge Trailhead in Sperryville (bonus - you won’t have to get on the Skyline Drive and so can avoid park fees) . I recommend starting on Buck Ridge which has a lot of stairs to help with the ascent. This trail ends at the Meadow Springs parking lot where you can cut up to Mary’s Rock. Once you get back to Meadows Springs, follow Buck Hollow and it’s babbling brook back to your car. The Buck Hollow area offers a lot of solitude and as a result frequent Black Bear sightings. Black bears are probably the most docile bears, so i would count bear sightings as another plus to this circuit hike. Note- it’s easy to get turned around on this hike, so bring a map. If you are headed back towards DC, Marshall’s Main St. has several good options for a post-hike nosh. Gentle Harvest is a great crowd pleaser as they have a plethora of options from salads to ramen to pie milkshakes (they put a whole slice of pie in the milkshake). They also have tons of fancy picnic fixings if you wanted to pick something up on your way to Mary’s Rock. Next door is the Red Truck Bakery which serves soups and sandwiches alongside their famous moonshine cakes and other baked goods. Across the street is The Whole Ox which specializes in fancy burgers and cocktails. Since all of these options are pretty fast and casual, you could sample something from each one for a progressive dinner. Shenandoah's most popular hike is Old Rag and for good reason. There are two options for getting to the 360 degree views at the summit. If you park at the Old Rag Parking Area you can do the 9 mile circuit hike which involves a really fun rock scrambling portion. Since some of the scrambling spots require longish legs, I would only recommend this option for kids age 9 and up. If you would like to skip the scramble, you can park at the Berry Hollow Parking lot and do a 5.4 mile out and back hike to the summit. While not as fun in my opinion - this is the best option for families with little kids. The prettiest time to do this hike is when the leaves are changing colors, but beautiful fall weather will bring crowds and traffic jams at the trickier scramble spots. The many photo-worthy spots are partly to blame for the traffic jams. The view from the top just as the leaves are starting to change colors. 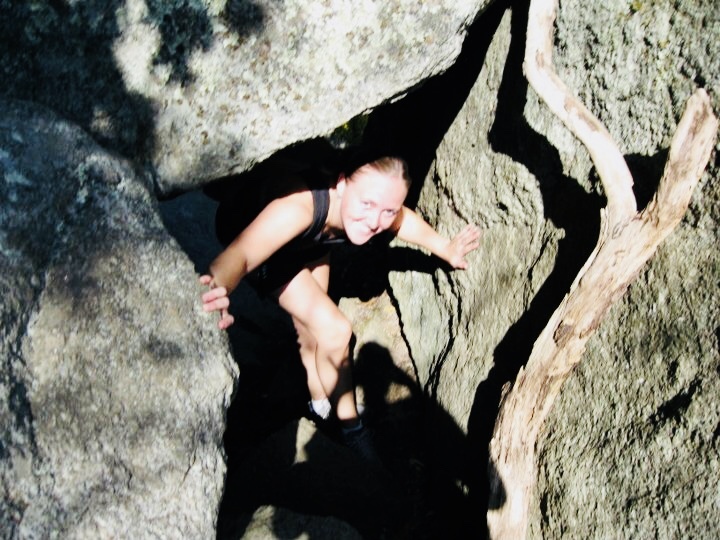 Old Rag is also a popular spot for bouldering. If you are headed back to the DC area, Narmada Winery in Amissville is my pick for a post hike nosh. Narmada is an Indian-owned winery and therefore specializes in crafting wines that pair well with Indian food which they also sell. You can enjoy a glass of their wine alongside Samosas and butter chicken. They often have a full Indian buffet during their special events. If you are with kids, you will appreciate their playground with nearby picnic tables. If you don’t already have a National Parks Pass, the cost to enter the park is $30 per vehicle for seven days. You can purchase an annual pass to Shenandoah for $55. Park fees are waived on Martin Luther King Jr Day, Veterans Day, National Public Lands Day, and the first day of National Park Week. While there is free parking at all of these trail heads, you will likely have to pay a private land-owner $10 to park if you arrive to White Oak Canyon or Old Rag after 9 AM.